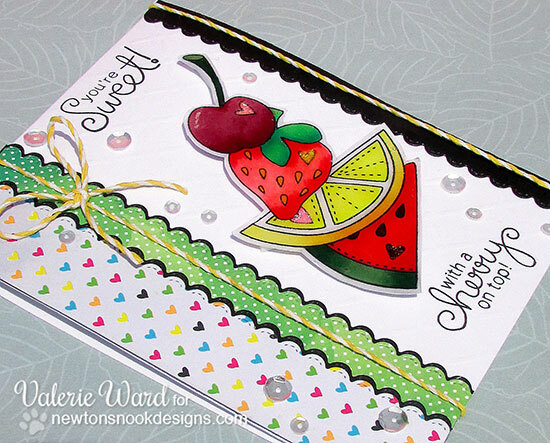 Newton's Nook Designs: Sweet Fruit Card by Valerie Ward! Yummy Fruit Card by Valerie! This yummy card by Valerie is so pretty! I just LOVE this beautiful stack of fruit with the little bits of glitter on the hearts! So pretty! 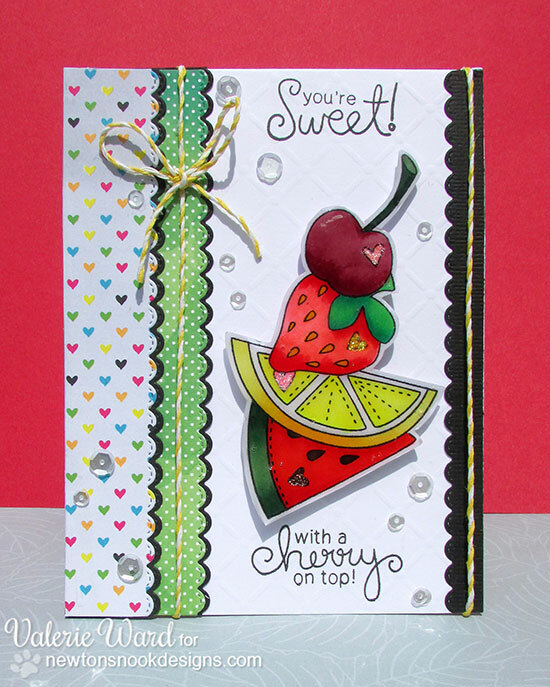 Valerie used the all the yummy fruit stamps from our Sweet Summer set along with the cute sentiments to create this card. I love all the pretty colored scalloped borders with just a touch of black to balance it out! Sadly, this is Valerie's last post on the Newton's Nook Designs Team! Valerie has made so many beautiful cards for us over the last six months and we have really enjoyed having her on our team! We wish her ALL THE BEST as she continues on to other adventures! Thanks so much Valerie for all the inspiration you have given us - we've enjoyed every moment - and we can't wait to see what you do next! Make sure to head over to Valerie's Blog - Val by Design to say hello today! Such a cute card, love the stacked fruit and yummy colors! Good luck with your new adventures, Valerie! Valerie, your card is eye-catching gorgeous! The stack of fruit is such a fabulous way to showcase these delightful images and your colouring: WOW!! The layout is amazing! Good luck on your next adventures; you've shared amazing inspiration here at NN! We'll miss you, but we know where to find you! !